Between Stitches: what is a Wang Chung? Well, I think I Wang Chunged a bit too much in my chair so now I'm forced to interrupted my regularly scheduled program of quilting and take out some stitching that went Wang Chung. Wait, this quilting and listening to music is perhaps not a good idea. How am I supposed to Vogue and keep my stitches straight? This is just not going to work! Sorry about that, where was I? Oh yes - iTunes is so totally sabotaging my efforts to quilt with any seriousness, so you know what they say: "If you can't beat 'em, join em!!" Come on iTunes, bring it on! I throw down my glove, I accept your challenge! let's groove! What a beautiful log cabin quilt and the logs are so narrow! Yikes! I know the logs are thin, but I like them that way in this quilt. it just reminds me of peppermint sticks! keep sharing the pictures of it! 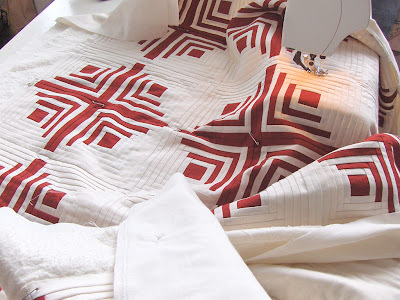 It is inspiring me to make a red and white quilt. thank you Kathie! I promise to keep sharing my adventures as this is a first with machine quilting! I too am thinking about making another red and white quilt because of this one - there's just something timeless about them, don't you think?